AT the Down Arts Centre on Saturday 18 January the hunt is on for local singers. ‘A place in the choir’ is an event aimed at singers who might be interested in joining their local community choir, Voices of Lecale. 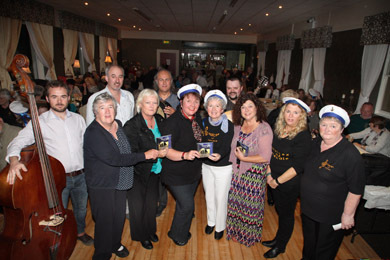 Voices of the Lecale pictured recently during the launch their latest CD with their backing musicians at Downpatrick Golf Club. Musical Director Laura Plummer said: ‘If you have seen the TV programme ‘The Choir’ it will give you an idea of what we’re doing. Basically, I’m looking for singers, regardless of whether they have sung in a choir before, who would like to join our choir and take part in public performances. I’m particularly keen to recruit male singers and women with lower voices. We are a very friendly bunch and as well as the singing there is a great social side in belonging to the Voices. “The choir was founded in 2007 and in the past six years it has notched up an impressive list of performances at all sorts of venues and festivals throughout the area. They are an inclusive group with the motto ‘If you can walk you can dance, if you can talk you can sing’. We also have three CD’s under our belt, the most recent being ‘Voyages‘ a collection of shanties and songs of the sea. We are also delighted that County Down folk icon Tommy Sands i spatron of our group. Members have been drawn from the Singers’ Circle night class which has been running at Down Arts Centre for almost 10 years now. 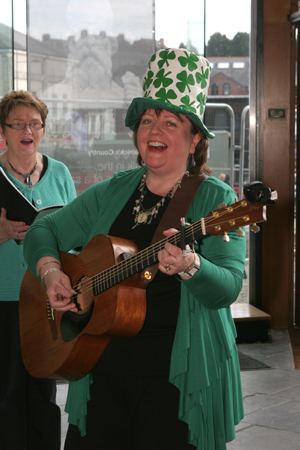 Folksinger Laura Plummer with the Voices of Lecale singers during St Patrick’s Day in the St Patrick Centre. ‘We currently have 29 singers but really need to attract some more men/low voices to give us a better balance in the voice parts. We have a wide-ranging repertoire of songs… everything from Irish and Scottish folk and traditional pieces to bluegrass and gospel and songs from every corner of the world. Laura explained that when people think about choirs their first concern or worry is often about auditions. She said”I don’t do auditions as such. I am an Associate Member of the NVPN (Natural Voice Practitioners Network) and our philosophy is founded on inclusion and using your natural voice. * and to have a positive, generous attitude in doing your bit for the group. “We have great team spirit and loyalty in the choir. One of the community spin-offs of belonging to the Voices is the work they do for good causes. In their first five years we have raised over £12,000 for various charities such as cancer and kidney research, the Alzheimer’s Society and the RNLI. The choir is just about to make it’s latest donation, this time to PIPS, a charity working in the field of suicide prevention and which supports families affected by suicide. ‘A place in the choir’ is taking place on Saturday 18 January at Down Arts Centre from noon to 1pm. Or telephone: 028 4419 630.